I probably wouldn’t have changed, I probably would have ended up doing just what everyone else was doing if it wasn’t for getting into kettlebells in 2002. Begrudgingly getting into something that was so game changing to me is a perfect example how sometimes life takes you in directions you don’t expect. More than kettlebells though, the experience taught me to think differently about strength training. A great example is how many people misunderstand kettlebell swings. One of the great lessons I learned in the early years of kettlebells was the value of progression. Somehow that has gotten lost over the years. 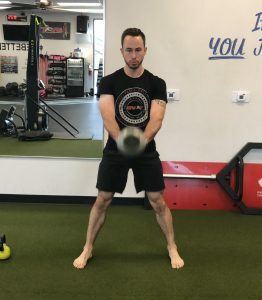 Yea, there is still levels of kettlebell movements being taught, but people still tend to jump WAY to many levels to get to their favorite movements like kettlebell swings. My time with the early kettlebell programs also taught me to look how small things can make a big difference. Once again, kettlebell swings are one of those movements that we tend to overlook how those little things are so impactful. I get it, people love two handed kettlebell swings because they can use some serious heavy weight. Yes, that gets your heart pumping and it is a good strength training exercise. However, most people don’t give nearly as much love to one handed kettlebell swings. Guess what happens, the weight goes WAY down. Let’s face it, most people don’t like it when THAT is the result of going to a new challenge in their training. But man, so many good things happen when people move to one arm kettlebell swings. It has long been touted that kettlebell swings are great for powerful hip hinge exercises so we build great strength and power in the glutes and hamstrings. Plus in the upper body we get that dynamic plank. We learn how to move at one area powerfully and stabilize at another part. Awesome! 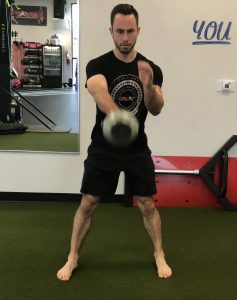 However, when we move to one handed kettlebell swings, we get a very dramatic change….we get the other planes of motion involved. Why does that matter? 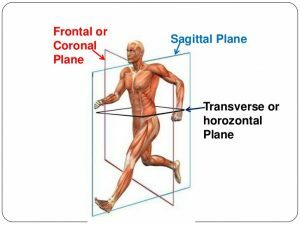 Pretty much EVERYTHING we do in life is all three planes of motion and we think magically, exercises that focus just on one plane will carry over. Sorry, it doesn’t work that way, it would be great if it did, but it doesn’t. How can I say that? Doesn’t just getting “strong” solve everything. There are many reasons that we don’t see this carryover, but this is the biggest one! The strength and ability to RESIST unwanted motion takes training. Just like getting stronger lifting something up and down takes work, so does learning how to resist those extra forces acting on the body. DVRT and kettlebell expert, Steve Holiner explains some of these ideas. You are learning that our DVRT concepts don’t only apply to Ultimate Sandbags because they are based on human movement. This ability to resist movement isn’t just good because it is how we move in life, but it will improve more stable exercises. In other words, when you really dial in your one handed kettlebell swings, go back to your two handed kettlebell swings. If you are like 99.9% of the people out there, you will find they just got way easier! How did that happen? The other benefit from focusing on exercises that have a combination of producing and resisting force is we have to activate more muscles to do both. Especially the smaller joint stabilizers that don’t get as much activity when we are perfectly balanced. Going back to progressions, sometimes the best ways to teach these functional fitness skills isn’t to just do more similar exercises, but to do something completely different. That’s because we want to think of the qualities that make up an exercise like one handed kettlebell swings. Check out how Steve shows you what that means and how it will change how you train! Love to learn how to train smarter? Want to see how great tools like kettlebells, Ultimate Sandbags and more go together? Then don’t miss our great DVRT workout programs HERE for 25% off with coupon code “save25”.